Here are the some of the key events taking place in the “Caitlin Star” universe. 1983 – A mysterious muscle-bound vigilante makes his first appearance defending a homeless man against a gang of bullies. 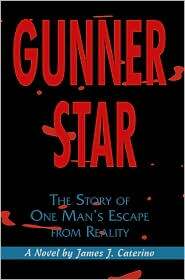 It is the first documented appearance of the man known as “Gunner Star”. 1985 – Gunner Star takes on his first protégé, a stock trader genius named Zahn. Gunner teaches him the “Bull Mongoni philosophy”, a credo of beliefs based on the teachings of a mythic race of hominids who vanished long ago. 1985 – 1990 – Gunner and Zahn become the Batman and Robin of Pittsburgh. They operate out of the shadows dispensing social justice and defending those who have no voice or power to fight back. 1990 – Zahn becomes increasingly aggressive and fanatical, wanting to go beyond the mission parameters of enacting vigilante justice. “All humans are evil. This mistake of history must be reversed. Only then can the Bull Mongoni rise again.” Gunner believes there are worthy humans who will have a place in the new world. 1991 - The disagreement between Gunner and Zahn leads to a falling out and a physical showdown. Zahn vanishes from Gunner Star’s Lair of Doom. 1992 – Gunner Star goes dark. 1999 – Gunner Star re-emerges as he takes on a new protégé named Joe Fenton. 2003 – Gunner Star rescues a young thirteen year-old girl from a group of would-be rapists and begins to train her in the ways of the Bull Mongoni. That girl is Caitlin Star. 2004 – Joe Fenton publishes the book, “The Sacred Scrolls ofTarmok”. It is the first time knowledge of the Bull Mongoni has been made public. 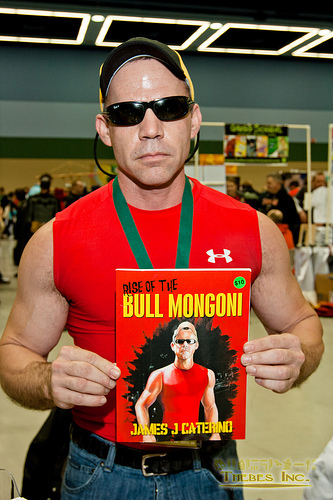 The book becomes an instant sensation and soon there is world-wide movement of Bull Mongoni disciples. 2005 - Gunner Star begins recruiting and training an elite band of warriors to build an underground army for the dark days of revolution that lay ahead. 2012 – A new recruit arrives at Gunner’s Lair and is to be trained by Caitlin. His name is Tyrone Fulton. 2012 – An anthropology professor named Lithgow and his grad student Lori travel to the Congo to verify an extraordinary event near a wildlife sanctuary—the arrival of a Bull Mongoni from the past named Tarmok. 2016 – The escalating culture wars result in the rigged election of a President Perkins and his new Moral Authority. Soon, any talk of an earth older than 6000 years is a felony and the bodies of all women of reproductive age are declared property of the state. 2018 – Perkins dissolves the Supreme Court and declares all of North America under the Moral Authority rule. Led by Caitlin Star and the Bull Mongoni, revolution begins!